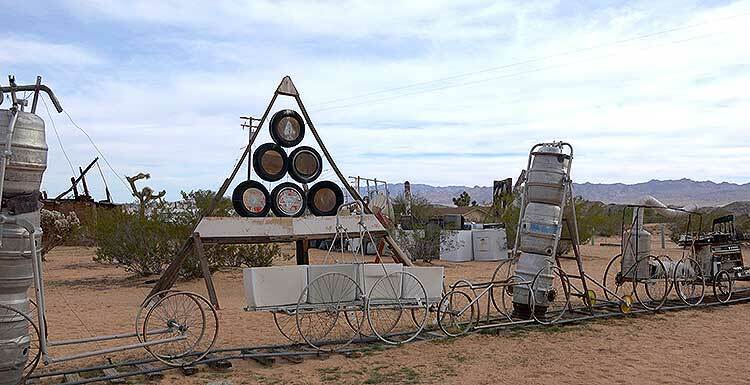 Just off of Rt 62 near the city of Joshua Tree, California, is the home of Noah Purifory and his Outdoor Desert Art Museum of Assemblage Sculpture. Recognition came when he, together with a group of collaborators, created an exhibition of pieces made of charred debris from the 1965 Watts riots called “66 Signs of Neon”. Widely acclaimed, it launched his career to a new level. 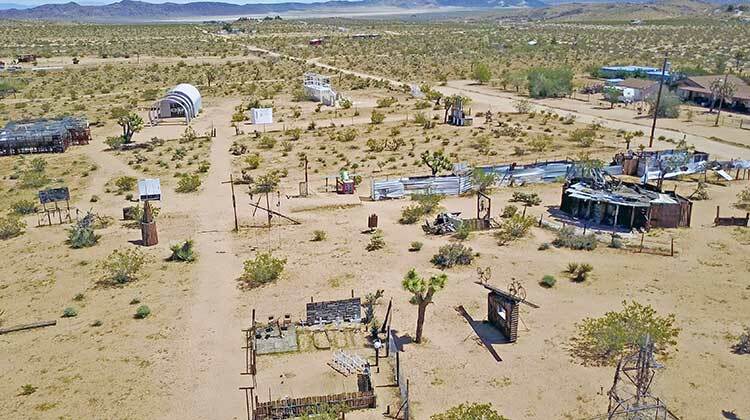 Later, in the 1980s, after working for the California Art Council, Purifoy moved to the Mojave desert and worked creating large scale outdoor sculpture. 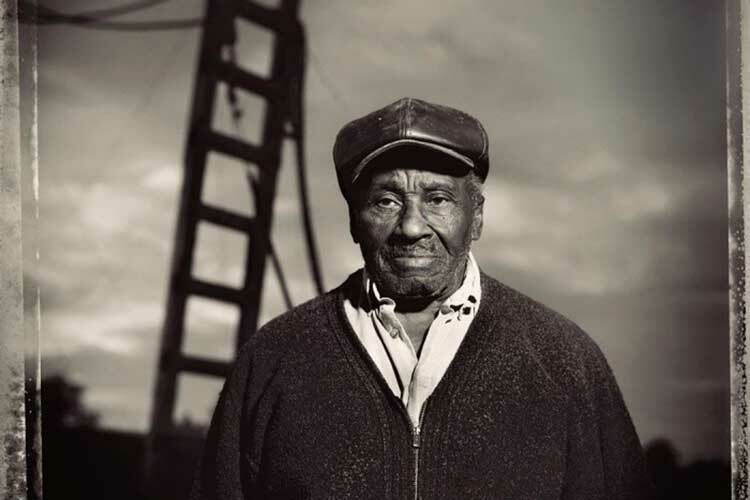 Purifoy died in 2004 in Joshua Tree, California. 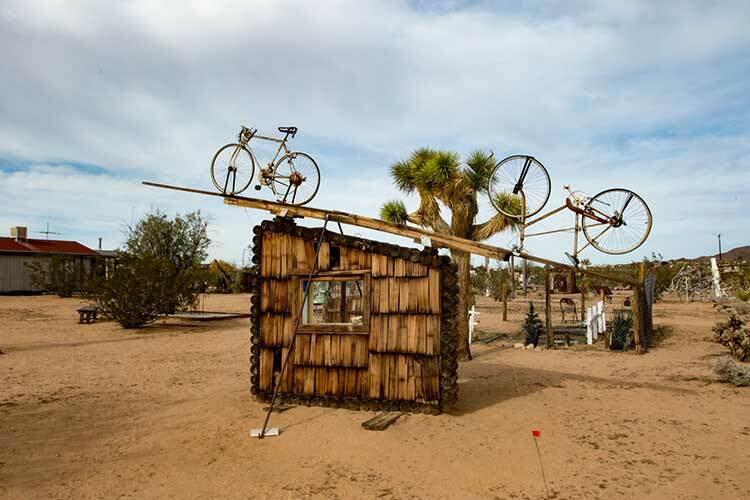 The sculptural site is now maintained by the Noah Purifoy Foundation. The museum isn’t easy to find, but it’s well worth the trip. 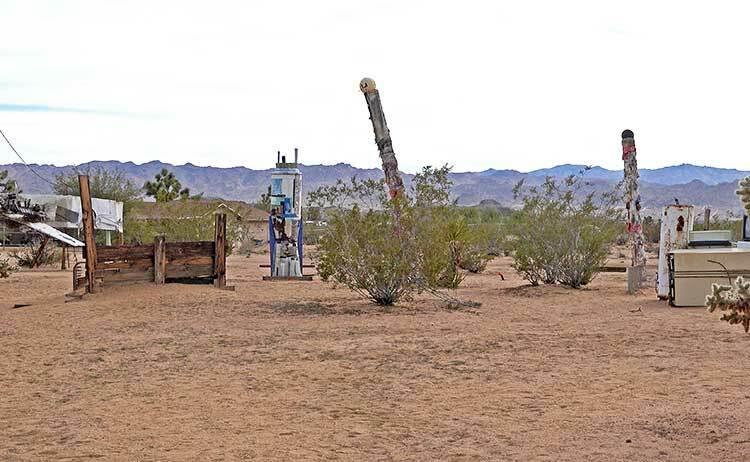 Here at DesertUSA, we try to visit all the interesting locations we hear about out in the desert; this one had been on our list for some time. When we arrived at 1pm on a sunny Wednesday in April, we were the only ones there. There was a brochure at the entrance that provided some background on the 10 acre lot and Purifoy’s art. His pieces are good examples of the old saying “one man’s trash is another man’s treasure”. 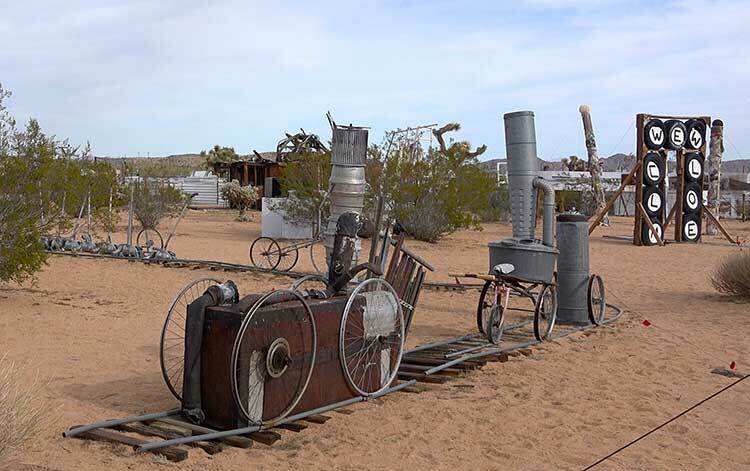 Limited funds inspired Purifoy to roam the region seeking discarded materials to create his sculptures. Many people were happy to find a home for their discarded junk — old chairs, bikes, tires, shopping carts, and much, much more. 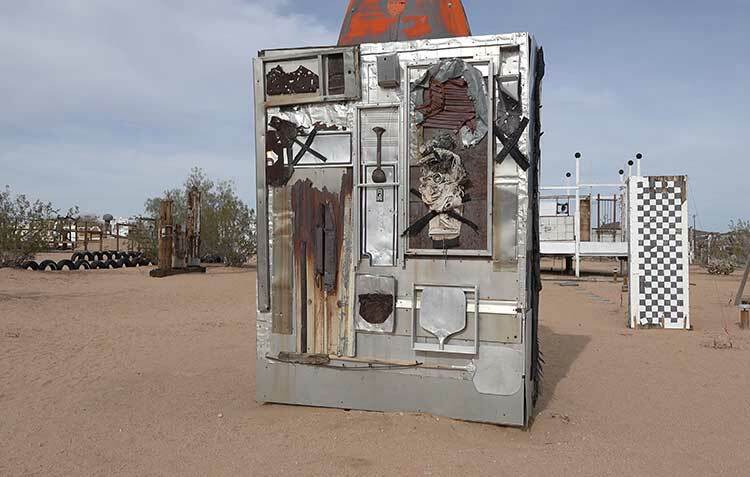 Purifoy's museum presents this “junk” as art, incorporated into the many pieces that fulfilled his inventive vision. 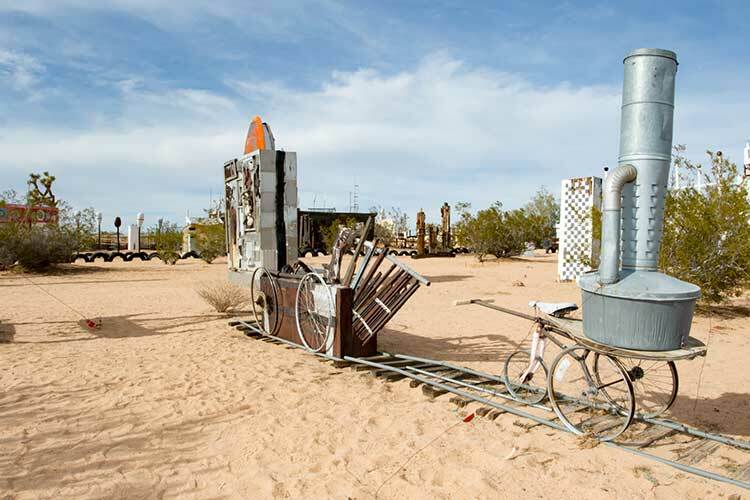 Noah Purifoy had an ingenious point of view, and a fertile imagination. He often expressed opinions on social events in his art. Below: a video and pictures of some of his artworks.